The Fifth Anniversary of a Historic Partnership Heralds a New One-Year-Only Design! About five years ago, we brought John Mercanti and the Perth Mint together to collaborate on a new coin series. Little did we know that we'd help start an international sensation! This match of the most prolific designer in United States Mint history along with the heralded Australian mint produced the first-ever Wedge-Tailed Eagle in 2014-- the first time a U.S. Mint chief engraver designed a coin struck by another official world mint. In 2014 and 2015, the series featured Mercanti's vision of an eagle in flight, ready to land. The next two years displayed a perched eagle with a stoic and majestic gaze. Now, for 2018, the time is due for another new creation -- one that, along with all designs to follow, will be struck for one year and one year only! GovMint.com is proud to present the latest addition to this acclaimed series, featuring not just one but an entire FAMILY of exceptional eagles! THREE EAGLES, ONE MAGNIFICENT DESIGN! -- For this 2018 creation, John Mercanti went back into his archive of unused designs originally submitted to the U.S. Mint. Featuring a baby eaglet being watched carefully by its mother, the father of the family is shown swooping in, ready to come home to the nest. It's the eagle family design that Mercanti has been waiting to create for years, finally realized in this stunning proof! BRILLANT CRAFTSMANSHIP IN PHENOMENAL HIGH RELIEF! -- Each coin begins as a hand-selected one-ounce planchet of 99.99% pure gold. Then, the artisans at the Perth Mint strike each coin multiple times with polished, curved dies. The result is a high relief proof with sharp, frosted details that tower over a deep, concave field gleaming with a mirror-like surface. 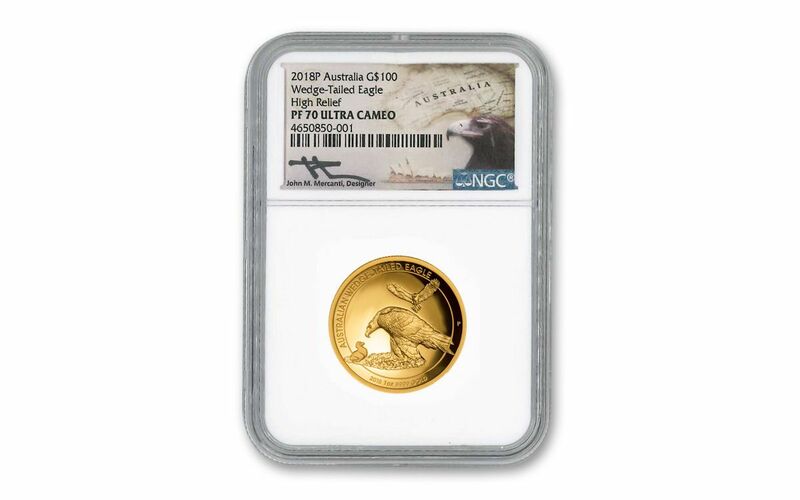 AUSTRALIAN LEGAL TENDER -- Each 2018 1-oz Gold Wedge-Tailed Eagle High Relief Proof is 100 dollars Australian legal tender. All the details are engraved on the obverse along with Ian Rank-Broadley's profile of Her Majesty Queen Elizabeth II. 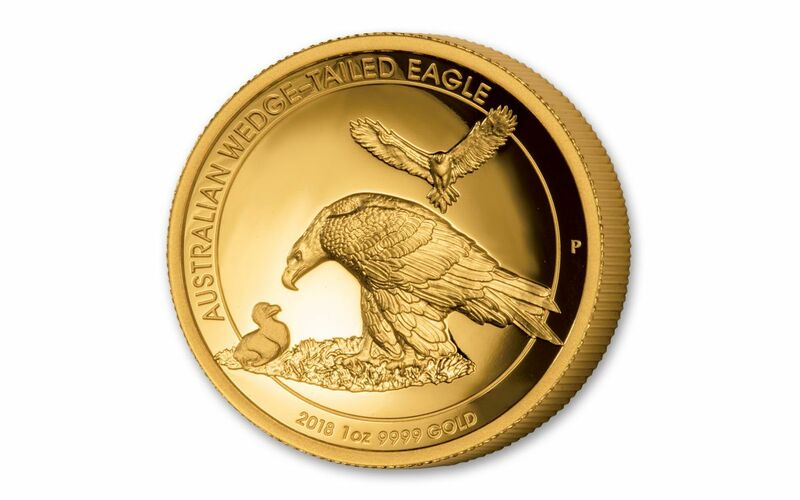 The coin's gold content, the year 2018 and the signature "P" mintmark join the wedge-tailed eagle family on the reverse. CERTIFIED PERFECT . . . -- Your coin will come certified Proof-70 Ultra Cameo (PF70 UC) by Numismatic Guaranty Corporation (NGC), a distinction that means your perfectly-graded 2018 1-oz Gold Wedge-Tailed Eagle High Relief Proof will have ZERO imperfections -- showing all features and fields exactly as the engraver and mint intended!
. . . WITH AN AUTOGRAPHED LABEL! -- In addition, your Gold Wedge-Tailed Eagle Proof will be sonically sealed in an acrylic holder, giving you the best in protection while granting clear sightlines into every beautiful detail. Inside that holder, you'll find another incredible feature -- a label hand-signed by none other than the designer himself, John Mercanti! A LIMITED MINTAGE EVENT -- The Perth Mint has set the mintage of these Wedge-Tailed Eagle High Relief Proofs at exactly 500! That's right - there are only 500 of these proofs for Wedge-Tailed Eagle collectors around the world! 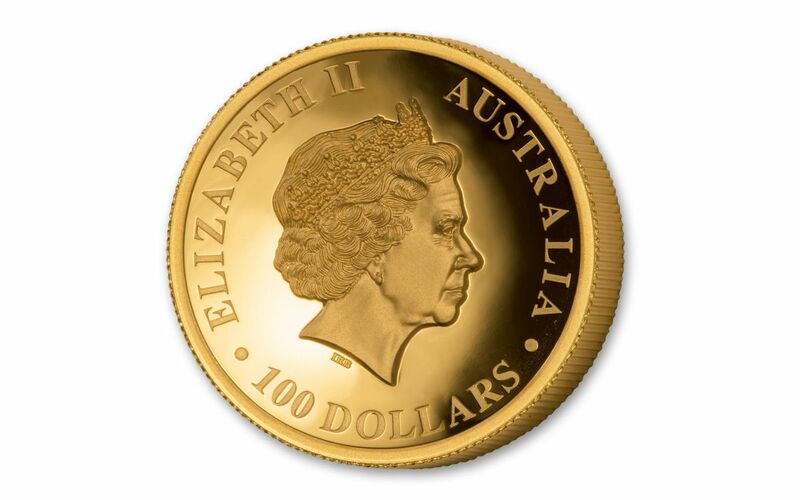 And, unless you live in Australia, your ONLY source for this gorgeous gold coin is GovMint.com. The entire Wedge-Tailed Eagle series has been a global hit since 2014, and we're expecting this installment to soar right out of our vaults. 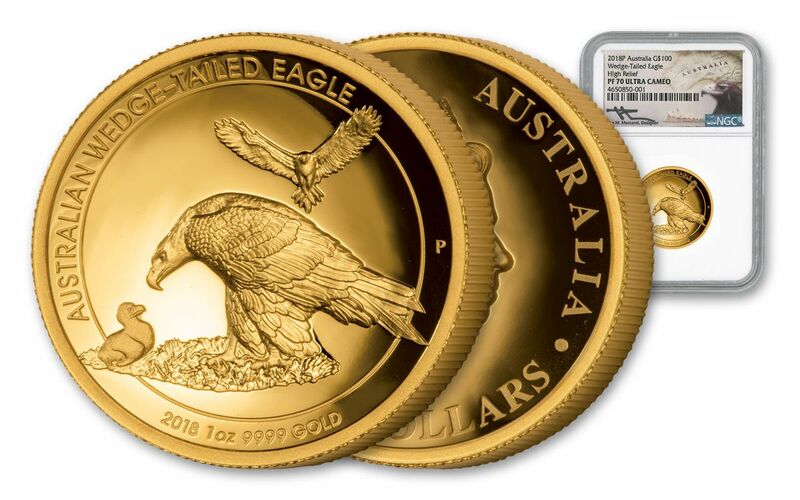 Don't wait another moment -- add this 2018 1-oz Gold Wedge-Tailed Eagle High Relief Proof to your collection today!